Office workers dress in business clothes. Women wear dresses, skirts with blouses, dress pants, or suits. Men wear suits, dress pants, shirts with collars, and ties. 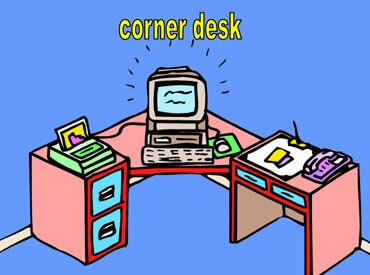 A computer, printer, and telephone are on top of this desk. 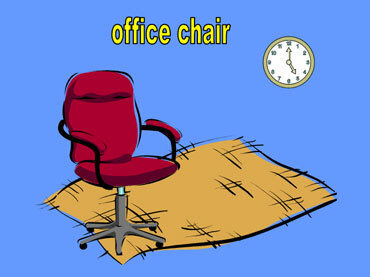 It's important to have comfortable office chairs so workers don't get backaches. Most office chairs swivel and tilt. You can adjust the height of some of them. Copyrights to the pictures and photos on this ESL and EL Civics website belong to individual photographers. We have purchased the rights to use them. Do not copy the pictures and photos on this site. Permission is granted to copy any of the worksheets for classroom use. Permission is granted to link to any page of this website. Contact Christina Niven, ESL teacher, at christina@elcivics.com. Please send corrections, comments, greetings, and requests for new photo tours, lessons, and civics units. Copyright © Christina Niven, 2007.